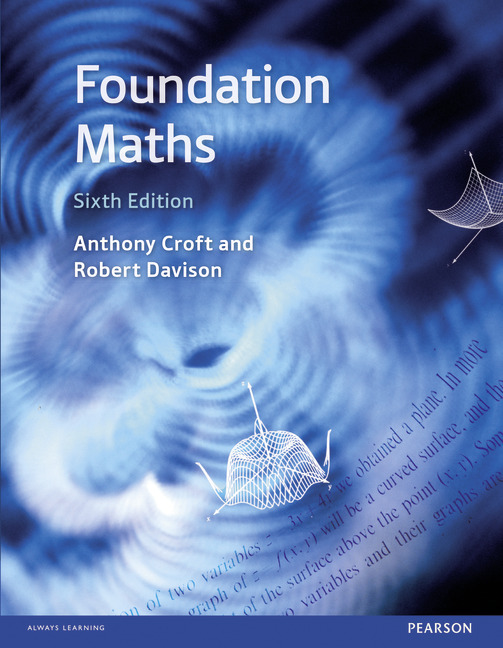 This package includes a physical copy of Foundation Maths, 6th edition by Croft and Davison as well as access to the eText and MyMathLab Global. To access the eText and MyMathLab Global you need a course ID from your instructor. If you are only looking for the book buy ISBN 9781292095172. Foundation Maths 6th edition has been written for students taking higher and further education courses who have not specialised in mathematics on post-16 qualifications and need to use mathematical tools in their courses. It is ideally suited to those studying marketing, business studies, management, science, engineering, social science, geography, combined studies and design. It will be useful for those who lack confidence and who need careful, steady guidance in mathematical methods. For those whose mathematical expertise is already established, the book will be a helpful revision and reference guide. The style of the book also makes it suitable for self-study and distance learning. MyMathLab Global is designed to improve results by helping students to quickly master concepts. Comprehensive online course content - Filled with a wealth of content, MyMathLab is available as a standalone online solution or it can be tightly integrated with the author approach of your choosing. You can easily add, remove, or modify existing instructional material. You can also add your own course materials to suit the needs of your students or your department. Interactive Exercises with Immediate Feedback - MyMathLab's homework and practice exercises reflect your choice of approach and learning style, and regenerate algorithmically to give students unlimited opportunities for practice and mastery. Comprehensive Gradebook - The online gradebook automatically tracks students' results on tests, homework, and practice exercises, and gives you control over managing results and calculating grades. View, analyse, and report learning outcomes clearly and easily, and get the information you need to keep your students on track throughout the course. Adaptive Learning - Not every student learns the same way and at the same rate. Thanks to advances in adaptive learning technology, we can now offer you a personalised learning journey. MyMathLab’s adaptive study plan test you up-front on the key content you need to know to succeed in your course. After taking a test or quiz, MyMathLab analyses the results to provide you with personalised homework assignments so that you can focus solely on just the topics and objectives they have yet to master. Interactive Exercises with Immediate Feedback - MyMathLab's homework and practice exercises regenerate algorithmically to give you unlimited opportunity for practice and mastery. Mobile-Friendly Design - MyMathLab's exercise player has been updated with a new, streamlined, mobile-friendly design! You can access your course from iPad and Android tablets to work on exercises and review completed assignments. Anthony Croft has taught mathematics in further and higher education institutions for over thirty years. He is currently Professor of Mathematics Education and Director of sigma - the Centre for Excellence in Teaching and Learning based in the Mathematics Education Centre at Loughborough University. He teaches mathematics and engineering undergraduates, and has championed mathematics support for students who find the transition from school to university difficult. He has authored many very successful mathematics textbooks, including several for engineering students. In 2008 he was awarded a National Teaching Fellowship in recognition of his work in these fields. Robert Davison has thirty years’ experience teaching mathematics in both further and higher education. He has authored many very successful mathematics textbooks, including several for engineering students.